From its inception, Green Bloc works to build community resiliency, resulting in impactful projects which last long after each project has finished. When Green Bloc began as a pilot project in 2013, our Vancouver team drew inspiration from Mark Lakeman, co-founder of City Repair Project. 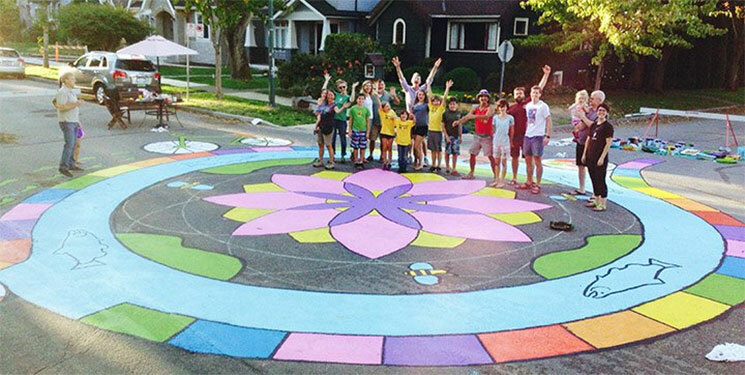 City Repair Project has worked on many placemaking initiatives in the Portland area, including street murals, permaculture projects and more. As a result of this inspiration, we focused on creating physical projects in our pilot neighbourhood that would build community resilience. We wanted Green Bloc to leave physical and artistic legacies for years after programming had wrapped. As Green Bloc became more established over the past five years, placemaking became an essential component of the project in every neighbourhood. Placemaking is unique in its ability to build and promote community resiliency, which is a central theme of many of Green Bloc’s legacy projects. The most famous of our projects is the street mural, seen here (photo) during installation. In 2015, as Green Bloc was wrapping up in Riley Park, we wanted to create something in the neighbourhood that would be a semi-permanent legacy to the work the neighbourhood had done in lowering their ecological footprint. The mural was designed through charrettes with members of the neighbourhood and features several important elements representing a low ecological footprint, including green feet, a bicycle, fruits and vegetables. We also incorporated fish, to represent that the intersection where the mural was painted is over an old stream. In an act of genuine community involvement, over 50 people, including many families and children, came to help paint the colourful mural that can still be seen in Riley Park today. In Kensington-Cedar Cottage, participants wanted to activate a local park as part of their Green Bloc programming. The space was often used by kids in the community but was lacking ample shade and a central gathering space. In 2017, with Green Bloc legacy project funding, they installed a public piano in the park, as seen here (photo). 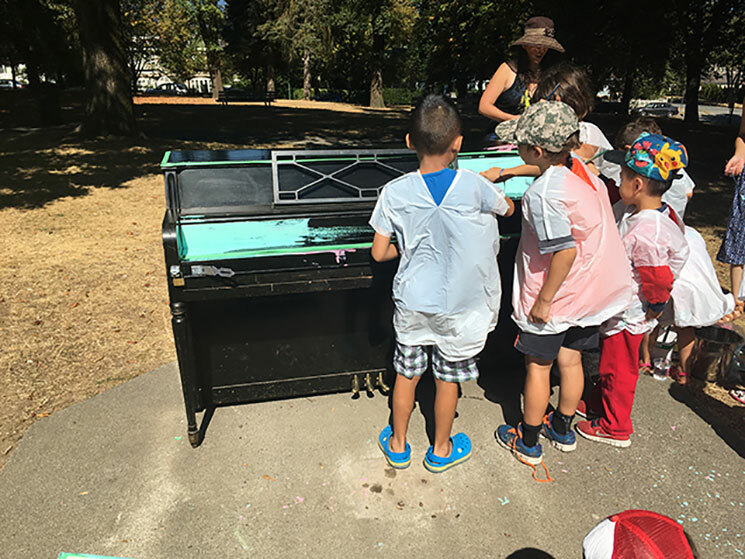 The piano was then painted by a group of school children as a public art project. In late 2018, after receiving further funding from the Parks Board, they built a shade structure over the piano site. Today, the piano and shade structure both still stand, providing a space for kids and parents alike to gather, share music and enjoy their local park. Safe active transportation is a big priority for those who live in Dunbar-Southlands. Most of our Green Bloc participants have children, and they want to make sure that the kids feel safe biking and walking to school. Each year, they set up a block party that spans multiple blocks of the Dunbar-Southlands neighbourhood. Every street is activated with different outdoor activities and kids spend hours biking up and down the closed streets. To further this project, we received funding from Viva Vancouver for a mobile placemaking kit. 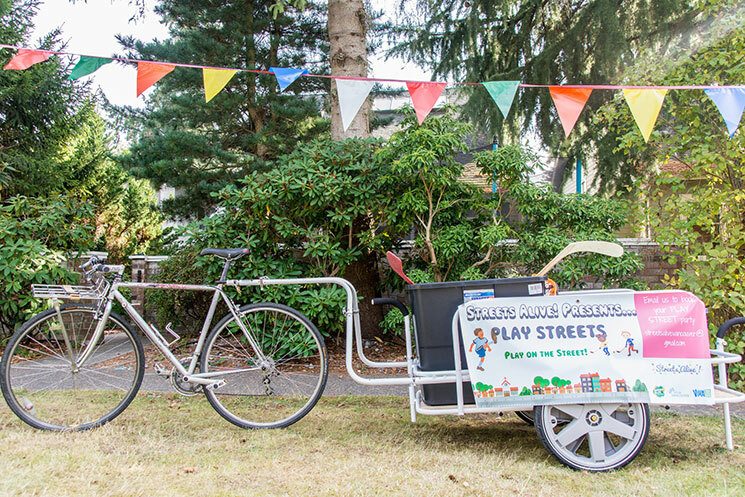 The kit sits in a custom-designed bike trailer, and features games, toys, and basic infrastructure needed to hold a block party or street activation. The trailer can be borrowed by anyone and is easily wheeled away. The mobile placemaking kit allows the neighbourhood flexibility in when and how it’s used, and helps to promote safe mobility for all ages. These are only a few examples of the legacy projects implemented through Green Bloc. Others include a community bulletin board, pollinator pathways, public art installations and a community garden. Placemaking takes time and deliberate partnerships, but through projects like Green Bloc, we are able to help neighbourhoods build community resiliency. To learn more about Green Bloc, visit our website. Green Bloc is generously supported by Vancity, the Sitka Foundation, and the City of Vancouver.